From our experience, first aid is all about laying a solid base. Its often overlooked because it’s not as fun as other aspects of prepping and because most people aren’t trained in first aid. For most people, a first aid kit is a small box that costs around $20 at your local big box retailer. To preppers, it’s a little different. We want a first aid kit that will lay the base for the majority of our first aid needs in a disaster. This kit can be called upon outside of a disaster, too. During illness or injury at home, your base kit should store the items you need most in those situations. One of the things we add to our base kit, in my home, is Children’s Tylenol. You won’t find a kit that offers that but it’s a personal need so we store that ourselves. Another struggle that many people face, in terms of first aid, is training. However, this is a matter of commitment and not funding. If you have the commitment you can attain the training for free and become part of the community emergency response team. CERT training is great and while it’s a time investment it comes free to all. Just find your local branch and their next scheduled training. Are you tuning in to Medical Monday? Every Monday we offer a new show from the archives that focus on first aid, natural healing and information on dealing with illness and injury. Join us every Medical Monday and get first aid ready with PBN. 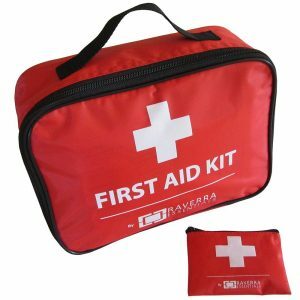 This is my recommendation for a base first aid kit for your family. Yes, it costs more than $20 and when you get your hands on it you will know why. Having held, used and stored this item myself, I feel like its a great option for families and a great base to build on. Survival Emergency Solutions is a company that I have done business with and we are proud to offer their products to our listeners.